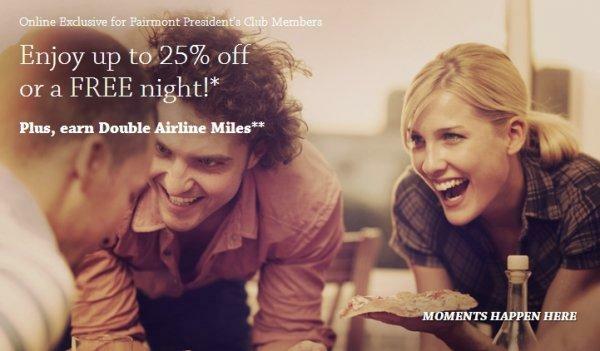 Fairmont President’s Club has a new (actually the same old) promo for extra discounts or for a free night + double miles at participating programs until September 30, 2014. The double miles offer is applicable for the following programs: Aeroplan, Asia Miles, JAL Mileage Bank, JetPrivilege, PhoenixMiles, KrisFlyer, MileagePlus and Miles&More. You can access Fairmont’s website for this offer here. My wish would be that Fairmont would merge the three brands (Fairmont, Raffles & Swissotel) under the same loyalty program. They already really are because the same number is somehow shared across the different brands. I just found this out when my Swissotel award was showing on a Fairmont President’s Club available certificate print out that a hotel gave me (cannot see that online under my Fairmont account). Fairmont should really spice up this never ending double miles promotion and offer something more substantial. I stay at Fairmont hotels few times a year to use my Platinum certificates, but that’s about it. Book now for stays until September 30, 2014. Offer is subject to availability at time of reservation at participating Fairmont Hotels & Resorts locations worldwide. Offer varies by property and includes one of the following: up to 25% off the room rate at the time of reservation OR a complimentary consecutive night stay at a single property based on a minimum night stay. Advanced reservation is required and a non-refundable deposit will be taken at time of reservation. Fairmont President’s Club Members may be required to present identification at check-in. This offer is subject to change without notice and cannot be combined with any other offer. Blackout dates apply and vary by property. For complete offer details by property please click here. Earn double reward miles with the American Airlines AAdvantage program, Aeroplan, Asia Miles, JAL Mileage Bank, JetPrivilege, PhoenixMiles, KrisFlyer, MileagePlus and Miles&More. Mileage program membership number must be provided to the hotel, and can be added to the guest’s Fairmont President’s Club profile. Please allow four (4) to six (6) weeks for Miles to be credited to your account. For complete terms and conditions by program please click here.